The BOSU has become a "must have" tool for balance training. The BOSU is like an Exercise Ball that has been cut in half with a stable side and an unstable side. It's very versatile - you can use it for everything from cardio to rehabilitation to pilates or yoga. With the dome side up, you can stand, squat, sit or use it just like you would a step for aerobics. Your body is constantly shifting and contracting to stay aligned. This helps burn more calories, and enhances coordination and balance. Turn it over and you can use it as a bench (for strength training), push-ups or just sitting on it to test your balance. 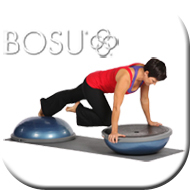 The BOSU adds FUNctionality to any workout! The BOSU targets the core muscles of your body - those muscles around your abdominal and back area helping you to not only gain strength, trim and tone but to help coordinate your entire body. Virtually any exercise you can perform on the ground can be performed on the BOSU - making that exercise More Challenging! More Fun! and More effective!